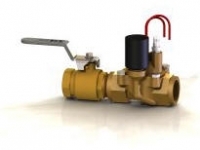 Griswold Controls’ Irrigation Piping Packages offer a wide selection of the components a contractor or landscape professional needs along with a high quality diaphragm valve all in one compact package. These packages save time, labor, and money, ensure quick and easy distribution and installation on the job, and offer the convenience of using one supplier for multiple elements on a system. The components are placed in their exact required configuration along with the Griswold Controls valve, then tagged, boxed, and foam packed for added protection during shipment. The Irrigation Piping Package arrives pre-assembled and ready to install. Components available for inclusion in Irrigation Piping Packages are strainers, ball valves and unions. Irrigation Piping Packages are individually shrink-wrapped and tagged for fast and simple distribution at the job site. 100 Mesh stainless steel strainer and packing gland ball valve are ideal for dirty water applications as they allow for simple cleaning and maintenance.